What is the precise nature of the European Union? In European Integration and the Problem of the State: A Critique of the Bordering of Europe, Stefan Borg seeks to tackle this fundamental ontological question. Rather than position the EU as a unique form of political community, Borg argues that its practices of justification, legitimation and identification largely tally with those of modern statehood. While this book neglects to provide much discussion of possible counter-arguments, it nonetheless offers a valuable contribution to research seeking to explore EU polity-building and processes of statecraft, writes Furio Stamati. European Integration and the Problem of the State: A Critique of the Bordering of Europe. Stefan Borg. Palgrave Macmillan. 2015. What ‘is’ the European Union? To some it is more or less a state. To others it is just a ‘strange beast’ whose fundamental nature is unfathomable. Whatever the answer may be, ontological questions about the EU always entail embarrassment. Nothing in the present constitution of the EU polity or in its vision for the future helps in settling them for good. There is some sort of weakness in the European self, which makes the ‘strange beast’ image so well taken. The book is structured into eight parts: an introduction, a theoretical chapter, five substantive chapters and some brief concluding remarks. Firstly, Borg familiarises the reader with the classics (Jacques Derrida, Antonio Gramsci, Ernesto Laclau and others) that inspired his work, as well as with his assumptions on the nature of stateness and textuality. Author positioning exercises abound in the introduction, which contains some of the less rewarding passages of the book. Chapter One more sharply illustrates Borg’s main contention about the state-like nature and possible fate of the EU. His normative puzzle is clear and engaging and his discussion of the concepts of state and statecraft informative and convincing. In the remainder of the book, the author supports his claims with a series of critical examinations of EU integration theories, discursive practices and border policing. Chapter Two acknowledges the limits of neo-functionalism as a ‘political discourse’ on EU integration. Neo-functionalism introduced the very idea that the EU is a post-statist development, but its reliance on notions such as self-interest, loyalty and political community reveals its rooting in classical state theories of the social contract. Even worse, it never understood the geopolitical risks involved in uploading modern-era Realpolitik into the new centre of a pacified Europe. Chapters Four and Five are devoted to the analysis of legitimation discourses concerning, respectively, the EU’s aborted Constitutional Treaty and Common Foreign and Security Policy. Both discourses are performative in kind, since they attempt to crystallise the fundamental values of a European identity. In so doing, they end up suffering from the same dilemma that characterises modern statecraft and national self-identification practices: in Borg’s words, ‘the universal is being compacted in the particular’. The result is the creation of a centre without borders, unable to distinguish itself from ‘the other’. The EU is thus trapped in a pendulum swing between appeals to universal values such as peace or freedom and the appropriation of those same values on the basis of a self-attributed ‘exceptionalism’. Accordingly, it risks presenting itself as the exemplary bearer of the allegedly universal values it appeals to. Borg’s textual analysis shows how this fundamental ambiguity hampers not only the EU’s ability to act unitarily in the international community, but also its reactions to de-territorialised challenges such as terrorism or trafficking. Even accounting for its own integration process leads the EU to an existential crisis: is it an exemplary case or just a particular instance of nations coming together? This issue is rich with ontological implications for a comparison of statecraft and Euro-crafting. Along similar lines, Chapter Six looks at the case of the Greco-Turkish border, inquiring how the EU crafts its collective identity while confronting migration crises at border zones. This chapter’s anthropological analysis exposes initiatives such as FRONTEX as harshly devoid of any humanitarian character, administratively convoluted and ultimately frustrating for both migrants seeking integration and the police officers who patrol the EU border. Once again, the culprit is the weakness of the European self, which remains inadvertently unable to tame its hostility towards alterity. As a result, poorly structured border patrol initiatives are invested of polity-building responsibilities that far exceed their goals and operative capabilities. In his short conclusions, Borg summarises and restates the main claims of his work. Euro-crafting is akin to statecraft but, since the EU is unable to problematise its boundary-drawing practices, it remains even less able than the modern state to practise hospitality and minimise violence at its borders. Unfortunately, little alternative to the statecraft blueprint exists for the EU. Overall, Borg’s volume is engaging, well-structured and nicely written. His general argument and how each chapter contributes to it always remain clear, although the constructivist approach he espouses occasionally brings in a vocabulary and forms of author positioning that may puzzle readers unfamiliar with post-structuralism and postmodernism. The unusual choice of having eight chapters for less than 150 pages sharpens the analytical focus of each part without fragmenting the whole. The volume features clear connections not only in the progression of chapters, but also in its overall design. The substantive chapters all come with some pages of further theoretical discussion that make them fungible and informative even when read in isolation. Modularity makes the book, or excerpts taken from it, suitable assignments for students in their late master or early graduate school classes. Outside academia, it may well cater to EU experts and practitioners with a taste for politically engaged theorisation. 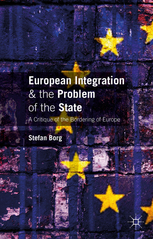 There is also much to commend in Borg’s parallelism between EU integration and state-building. Sure, his theoretical elaboration asks non-specialist readers to take a leap of faith, but it is a leap worth taking. By the time readers get to the end, they will feel reassured that the core tenets of the work have been probed through the analysis of theory, politics and policy. On the downside, one has to admit that possible counterarguments or mitigating circumstances are hardly, if ever, considered. Sometimes these omissions sharpen the argument, sometimes they make it naïve; in some other cases they go both ways. To make just one example, Borg advances a sound political science argument when he suggests that EU democracy and its constitutional discourse are in tension, given that the latter is an inevitable attempt to insulate a set of values from political contestation. However, when he adds that the Constitutional Treaty has failed to be ratified due to a popular backlash against the technocratic narrative of EU integration, he naively does away with the entire political and economic context of that event. The author of the book obviously sees himself as a critical theorist. He markedly, not to say defensively, stresses that his main goal is to pinpoint the limits of today’s EU, not to propose ready-made solutions. However, the lack of even a short pars construens may disappoint some readers and suggests intellectual one-sidedness. And yet, it would be unfair to dub Borg’s conclusions insufficient or pessimistic. They are better conceived of as the first step of a wider research agenda, whose merits are still impossible to predict. Whatever the omissions, simplifications and stretches in Borg’s volume, it has a real potential to revitalise the debate on EU polity-building and statecraft. This is possibly the greatest merit of his courageous and eye-opening exercise. Note: this post appeared on the LSE Review of Books, and a longer version of this review was originally posted on EuVisions. It represents the views of the author and not those of Democratic Audit or the LSE. Please read our comments policy before posting. Furio Stamati is a post-doctoral researcher in the Department of Social and Political Sciences at the University of Milan. There, he collaborates with the REScEU project (ERC), working on the topics of transnational politics, political leadership and democratic statecraft.